Learn more about our expertise and solution offers through customer testimonials. Each case study tells a real story related to compressed air. See how others have improved the safety, efficiency and performance of their system. For a fast-growing company, the increase in production leads to an increase in requirements for the volume and quality of compressed air. This has a direct impact on the quality of the products that is affected. Discover in this case study how Topring has provided solutions to improve the performance of the compressed air network and the efficiency of manufacturing equipment. The compressed air network of a car garage is at the heart of the smooth running of operations. Its efficiency must be the priority because the lack of power in the tools prevents the mechanics from being able to do their work in time. Discover in this case study how Topring's expertise has provided solutions to improve the performance of compressed air tools and ensure a good efficiency of air delivery to the tools. For a plastic injection company, the use of poorly fitting pipes for their needs has a major impact on lost productivity. This is reflected on their operations. Find out in this case study how Topring's expertise has helped to quickly identify the root cause of the problem and provide much better solutions for their situation, which has greatly improved the efficiency of the business. An air network can quickly look like an octopus if its design is done without much knowledge of good practices. This causes a lack of air to the equipment located furthest from the compressor. For a carpentry workshop, this is synonymous with increasing the rejection rate of finished products. Indeed, the lack of air makes the application of paint uneven. The job is to be start again. 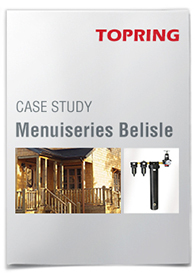 See in this case study how Topring solutions have made it possible to optimize the performance of the compressed air network. An average plant loses 20% or more of its compressor capacity due to air leaks. Every time a pressure increases by 2 PSI, it requires the compressor 1% more energy; every PSI lost due to leaks is therefore very costly. Learn how a leading-edge yarn manufacturing has optimized the energy efficiency of its compressed air network with a leak detection program from Topring. For an expert in transportation of hazardous industrial waste, achieving a pressure differential greater than 10% between the compressor and the rest of the equipment has a major impact on lost productivity. 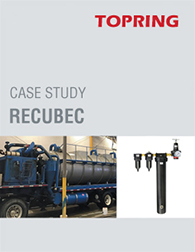 Find out in this case study how Topring's expertise has provided solutions to improve the performance of the Recubec compressed air system and ensure a good efficiency of their equipment.